School Groups at GeerCrest Farm! We have a unique place in the Willamette Valley in that we are also centered upon a homestead that raises milk- and wool-producing animals, uses organic and sustainable methods of farming, and promotes healthy and cooperative lifestyles. Because of the many opportunities we have to offer, we have chosen to invite educational groups to join us at the farm to experience what life on this homestead was like historically and the wealth of skills and values it has to offer us today. So much of the farm life experience gives students real-life applications of curricular standards in history, biology, physical sciences, mathematics, economics, art and home economics. Students, teachers and chaperones are invited to visit GeerCrest for a field trip from 10:00 am-2:00 pm. The day begins with an introduction to the farm and its history, and a visit to the historic farmhouse, complete with many exhibits from 1847-1967. Students then take a guided farm tour, where they observe the farm’s multiple gardens,greenhouses and seedling houses, the wide variety of animals at the farm, and how the farm is organized. The focus for our farm is not to simply be a demonstration farm where students passively watch what is happening but an active, dynamic farm where students can work alongside our farmers to participate in a small slice of homestead life. Besides the farm tour, at least one hands-on project is a part of each field trip. Students bring their own sack lunches and eat at the farm. If an educational group would like to experience farm life more completely, our diverse homestead offers stays for from 1-3 nights for students third grade and older. When students stay overnight, they are able to more fully understand and participate in what farm life is truly about, from early morning feeding to evening chores and everything in between. Students will be incorporated into all aspects of farm life such as milking, working with wool, grooming and feeding the animals, taking care of the compost, planting and harvesting, caring for the garden, making and cleaning up meals, collecting eggs, cleaning the farmhouse, and many other activities depending on the season and the current projects happening when the students arrive. Students will be involved with farm activities from sunup to sundown, with some time to play on the farm’s spacious lawns at break times. 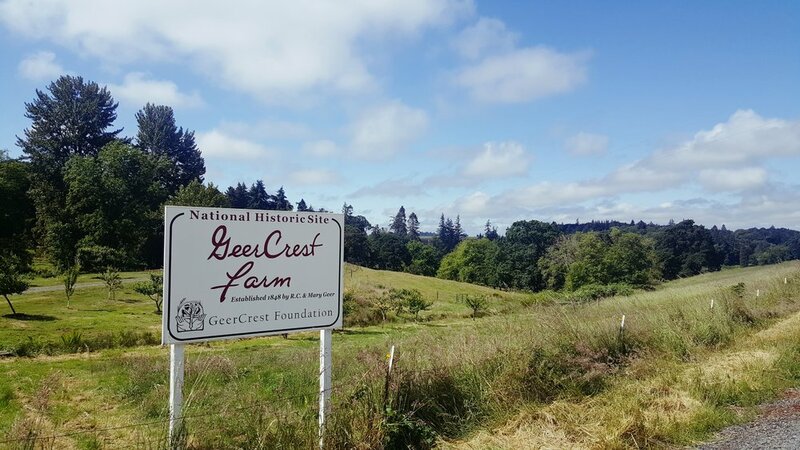 In the evening there is time for historical education about Marion County’s pioneers and how GeerCrest fits into Oregon history. After a full day at the farm, students will walk with chaperones to the nearby community hall, where they will sleep on their sleeping mats and bags. The next day, it’s back to the farm for another wonderful day as farmers! Usually groups who stay overnight will eat the farm-fresh meals that the students help to prepare. With advance notice, we are able to accommodate most special dietary needs. We look forward to sharing farm life experience with your school!